Bitcoin price is trading with a negative angle below the USD 6,400 pivot level. Ethereum extended declines and traded to a new yearly low near USD 165. 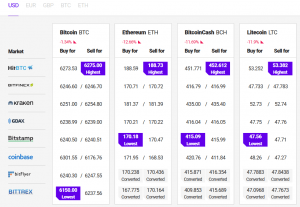 BTCD, NAS, PPT and GAS declined more than 15% today. There was an increase in selling pressure on the cryptocurrency market during the past three sessions. Bitcoin slowly moved lower and broke the USD 6,250 support. BTC/USD is now trading well below the USD 6,400 pivot level and it could continue to move down. Ethereum remained in a downtrend and it tumbled to a new yearly low near USD 165. Other major altcoins like ripple, bitcoin cash and litecoin are also heading south. Bitcoin price failed to stay above the USD 6,250 support and traded below USD 6,200. Later, BTC/USD recovered a few points and it is currently (UTC 08:20 AM) down 1.6% to USD 6,220. If sellers remain in control, the price could continue to decline towards the USD 6,100 and USD 6,050 levels. On the upside, the USD 6,300 level is an initial resistance, above which the USD 6,400 pivot level is the next crucial hurdle for bitcoin buyers. Ethereum price was one of the worst performers since it moved below the USD 185 support. ETH/USD traded to a new yearly low and close to USD 165. It seems like the price may perhaps continue to decline and sellers could attempt to push the price towards the next major support at USD 150. On the upsides, resistances are visible near the USD 180 and 185 levels. Bitcoin cash fell significantly and registered losses more than 12% to USD 410. BCH/USD broke the USD 450 support area to move further into a bearish zone. If buyers fail to defend the USD 400 support, there could be heavy losses in the near term. Ripple price is down around 5% and it seems like the price is about to test the USD 0.250 support. If XRP/USD fails to hold the USD 0.250 support, the next target could be USD 0.240. Many small cap altcoins declined heavily during the past few hours like BTCD, NAS, PPT, GAS, NANO, WTC, DGD, REP, FUN, VET, LSK, ZRX and PIVX. Out of these bitcoin diamond declined 15.5% and NAS by 15.3%. Overall, the crypto market remains under a lot of pressure, which may result in more losses in bitcoin and ethereum. If BTC/USD slides below the USD 6,100 and USD 6,000 support levels, there could be a solid rise in selling in the short term.